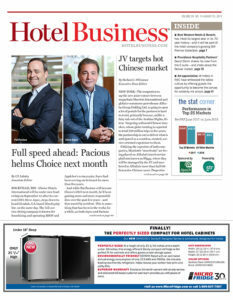 Hotel Business caught up with David B. 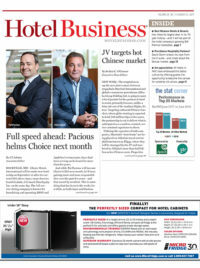 Storm, founder and president/CEO of Denver-based Providence Hospitality Partners LLC (PHP), to inquire about the company’s future, the current state of the Denver hotel market and the biggest threat to management companies. You once said, “If performance does not translate to personal accountability, then we should all stay home.” What did you mean by that? This statement was made at the onset of forming Providence Hospitality Partners and has become one of the cornerstones of our culture. It speaks directly to our belief that to be effective, you must take personal ownership of the actions required to be successful, and to have fully engaged associates, they must realize how their contributions play a role in our overall success. How many properties are currently in PHP’s portfolio? Geographically, where do you hope to expand? The current PHP portfolio consists of 12 properties, located from coastal California to upstate New York. We will open a new DoubleTree by Hilton Hotel & Conference Center in Greeley, CO, on Sept. 1 and are scheduled to break ground on an Embassy Suites in the central business district of New Orleans in approximately four months. How would you describe the Denver market? We have been a member of the Denver hospitality community for the past 30 years. The central location of Colorado places us within each coast of the United States in three hours. The Denver hotel market is currently one of the most vibrant markets in the United States. Our economy is diversified; our convention center is currently exploring another expansion; Denver International Airport (DIA) is among the nation’s best airports; and our workforce is well-educated, with people moving to Colorado from across the country to enjoy our outdoor lifestyle, career opportunities, sports environment and quality of life. While there are several hotels under construction in the downtown market, most are between 120-180 rooms and should be easily absorbed. Denver’s culinary community is fast gaining respect across the country and culinary professionals are relocating to Denver to be a part of this movement. The only wild card in the mix is the Gaylord Hotel being built near DIA. The property was originally going to be 1,500 rooms, but that is now being reconsidered for expansion. The Gaylord will generate a nationwide convention market, and we believe it will be beneficial to the overall market. How do you go about acquiring talent? Sourcing the best available talent is a critical challenge. Of course, we seek to promote from within first, and to this end, we have rolled out a new associate engagement program entitled Within Our Care (WOC). The WOC program provides career track development, training, mentoring and evaluation/counseling for each associate. PHP also recruits at colleges, high schools (seasonal), churches and community events—in addition to the traditional digital postings and use of approved hospitality recruiters. We look for qualified individuals with like-property experience, a history of accomplishments and a tenure of stability. When hiring associates without the desired experience, we hire friendly, personable men and women with a heart to serve, and we provide detailed training. You’ve mentioned using “unique strategies for marketing and management” in the past. Can you tell me more about that? Yes, unique strategies are just that: innovative for the specific market and property. They are research-based, creatively implemented and quantifiably evaluated. We would not position a property within a primary market the same way we would a property within a tertiary market. For example, we had an independent hotel in a tertiary market in Colorado, and we wanted to expand our regional audience and connect at an “emotional” level. 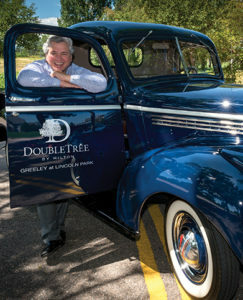 We participated in five regional parades, entering a vintage award-winning 1946 truck in each parade, including local dignitaries and hotel staff. Few things are as emotionally bonding with a community as a parade where friends, children and service clubs all participate together. PHP has formed “Harold’s Classic Cars & Trucks” to lease vehicles for our properties and is in the process of expanding our inventory of vintage classics. Tell me about the company’s development of freestanding F&B concepts for some properties. PHP has teamed with a group of restaurant consultants, in tandem with our F&B team, to develop market-specific, freestanding F&B concepts for our hotels. Today’s hotel consumer wants to experience local food offerings and trends specific to each locale. By developing a unique, locally inspired concept, with locally sourced ingredients, we can move away from the stereotypical hotel restaurant and compete as a member of the local culinary community. The same thought process holds true for beverage offerings, as mixologists move toward micro-brews, distilled spirits and wines to interpret their view of classic cocktails. What’s the biggest threat to hotel management companies currently? How has that threat evolved, and how can companies combat it? I suppose that with approximately 1,500 management companies in the marketplace, one of the biggest challenges is not to be viewed as a commodity. PHP seeks to address this challenge by attempting to become the “Best Version of Ourselves” and not to emulate others. Knowing who we are, what we do well and what is not in our best interest is critical.